As the Hindu Kush Himalaya (HKH) is one of the most vulnerable regions on Earth to climate change, implementing adaptation measures that target these mountains and downstream areas is crucial. But to what extent are existing national and sectoral adaptation policies relevant to the HKH, and where can they be strengthened? This was the focus of a two-day workshop, entitled ”Regional Policy Workshop on Adaptation Outlook for the Hindu Kush Himalaya,“ which concluded on 3 February 2017 at the International Centre for Integrated Mountain Development (ICIMOD) in Kathmandu, Nepal. 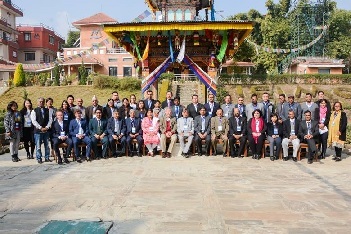 To address this issue, the workshop – jointly organized by ICIMOD, the United Nations Environment Programme (UNEP) and GRID-Arendal – brought together policy and research experts who focus on climate change and mountain ecosystems in the HKH and beyond. The workshop focused on building a foundation for assessing region-wide risk and vulnerability to climate hazards, and examining the existing adaptation policies and measures. By identifying policy gaps as well as opportunities, the findings of the workshop will provide decision makers with much-needed knowledge to meet current and future challenges from climate change and other drivers. During the workshop, participants reviewed and provided feedback on a background document entitled “Key Climate Risks and Adaptation Policies and Actions for the Hindu Kush Himalaya.” Government representatives shared their views on national adaptation approaches for mountain ecosystems coping with climate change. These discussions will lead to the development of a report titled “Outlook on Climate Change Adaptation in the Hindu Kush Himalayan Mountains,” which will be part of UNEP’s Mountain Adaptation Outlook series.